G-protein-coupled receptors (GPCRs) are essential in cell-cell communication and are considered as major drug targets. Although recognized as activating G proteins in a monomeric form (Whorton et al., 2007), numerous studies revealed their possible association into hetero-oligomers enabling allosteric controls between receptors (Pin et al., 2007; Ferré et al., 2014). The validation of this concept in vivo remains difficult and is a matter of intense debates (Pin et al., 2007; Bouvier and Hébert, 2014; Lambert and Javitch, 2014). The metabotropic glutamate (mGlu) receptors are members of the class C GPCRs activated by the main excitatory neurotransmitter, glutamate. These receptors are strict dimers and have until recently only been considered as homodimers (Romano et al., 1996; Kunishima et al., 2000). However, recent studies revealed the possible existence of heterodimeric mGluRs (Doumazane et al., 2011; Kammermeier, 2012; Yin et al., 2014; Niswender et al., 2016), as observed with other class C GPCRs (Marshall et al., 1999; Zhao et al., 2003; Pin and Bettler, 2016). The mGluRs constitute therefore an interesting model to tackle the issue of heterodimeric GPCRs in vivo. Among the eight mGluRs, mGlu1 and 5 (group I) are mainly postsynaptic, while mGlu2 and 3 (group II) and mGlu4, 7 and 8 (group III) are predominantly found in presynaptic terminals (Conn and Pin, 1997; Niswender and Conn, 2010). Heterologous expression studies revealed that group-I mGluRs on one hand, and group II and III mGluRs on the other hand could form heterodimers (Doumazane et al., 2011), leading to the possible existence of 16 additional mGluRs with likely specific pharmacological and functional properties. Identifying such properties is a difficult issue to address, although one can expect that they will be essential in identifying the roles of mGlu heterodimers in vivo. What limits such studies is the presence of both homodimers and heterodimers in cells co-expressing both types of mGlu subunits (Kammermeier, 2012; Yin et al., 2014; Niswender et al., 2016). Among heterodimeric mGluRs, mGlu2-4 was the most studied pair due to its important physiological interest and because different pharmacological tools are available (Kammermeier, 2012; Yin et al., 2014; Niswender et al., 2016). First, in the basal ganglia and the corticostriatal pathway, these two subunits are playing an important role in movement disorders such as Parkinson’s disease (Johnson et al., 2005). Second, previous immunohistochemistry and in situ hybridization studies suggest that mGlu2 and 4 receptors are co-localized in several brain regions (Neki et al., 1996; Bradley et al., 1999). Accordingly, mGlu2 and mGlu4 receptors could co-immunoprecipitate in native rodent tissue (Yin et al., 2014). However, it is difficult to detect pharmacological activation of any heterodimer using single activation protocols due to the co-existence of both homo- and heterodimers. Interestingly, the co-expression of the mGlu2 and mGlu4 subunits was reported to modify the pharmacology of mGlu2 and mGlu4 agonists. In addition, amongst the positive allosteric modulators (PAMs) of mGlu4 receptor, only one is active at the mGlu2-4 heterodimer (Yin et al., 2014; Niswender et al., 2016). The lack of effect of some mGlu4 PAMs in modulating mGlu4-mediated inhibition of cortico-striatal terminals was then used as a first evidence for the existence of mGlu2-4 heterodimers in the brain (Yin et al., 2014). However, in order to discern between homodimers and heterodimers, it is essential to find their specific pharmacological signature. In the present study, we developed two different innovative approaches to characterize the pharmacological and functional properties of mGlu2-4 heterodimers specifically, without any influence of the co-existing mGlu2 and mGlu4 homodimers. 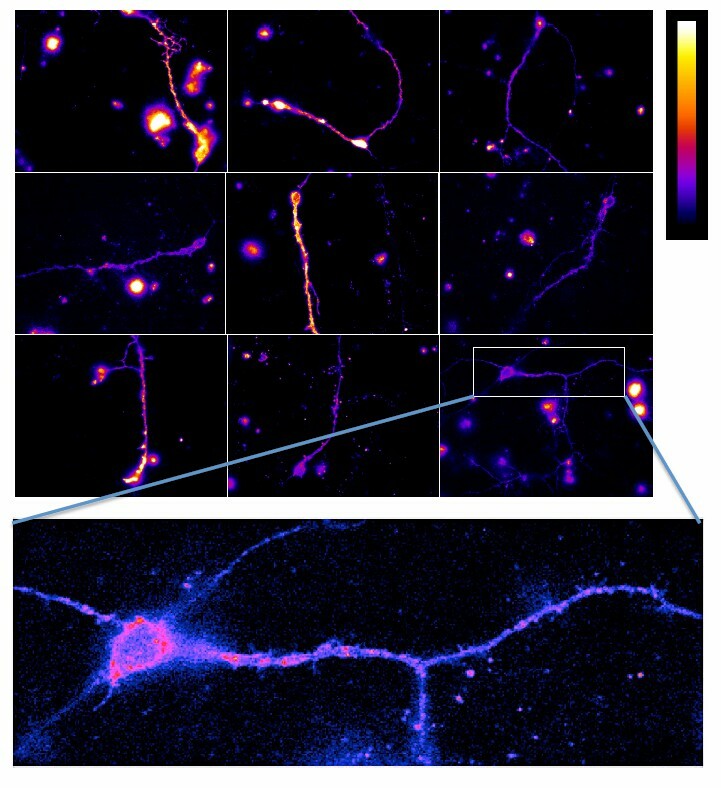 We also used an innovative lanthanide-based time-resolved FRET microscopy approach (Faklaris et al., 2015), to demonstrate mGlu2 and mGlu4 can form heterodimers in transfected neurons. Using our heterodimer selective assays, we identified three pharmacological fingerprints that can be used to identify mGlu2-4 heterodimers in native cells. Such fingerprints could be identified in a neuronal cell line that naturally expresses both mGlu2 and mGlu4 subunits, as well as in the lateral perforant path (LPP) terminals in the hippocampus. These data bring strong evidence for the natural formation of such heterodimeric mGluRs in brain cells. Our observation will then be useful to study the function of mGlu2-4 heterodimers in the brain, and most importantly, to set up the condition to characterize other GPCR heterodimers. The co-expression of both rat mGlu2 and mGlu4 subunits led to the surface expression of three types of dimers: mGlu2 and mGlu4 homodimers and mGlu2-4 heterodimers. We then set up the transfection conditions to obtain an optimal expression at the cell surface of the mGlu2-4 heterodimer (Figure 1A; Figure 1—figure supplement 1A–C). To that aim, we co-transfected various amounts of plasmids encoding CLIP-mGlu2 and SNAP-mGlu4, and quantified the surface expression of each dimer population measuring lanthanide resonance energy transfer (LRET) in a time-resolved manner (TR-FRET) between a long life-time donor (Lumi4-Tb) and a fluorescent acceptor covalently attached to N-terminal CLIP (Gautier et al., 2008) or SNAP (Juillerat et al., 2003) tags (Maurel et al., 2008; Doumazane et al., 2011). This approach allowed the orthogonal labeling of the subunits in any dimer combinations. The use of donor and acceptor SNAP substrates allows the specific labeling of mGlu4 homodimers with a TR-FRET pair. Similarly, the use of CLIP substrates allows the measurement of TR-FRET signal originating from mGlu2 homodimers exclusively. Eventually, the use of a combination of SNAP-donor and CLIP-acceptor substrates leads to TR-FRET originating from the heterodimer only, since any homodimers carry either the donor or the acceptor but not both (Figure 1A; Figure 1—figure supplement 1A–C). 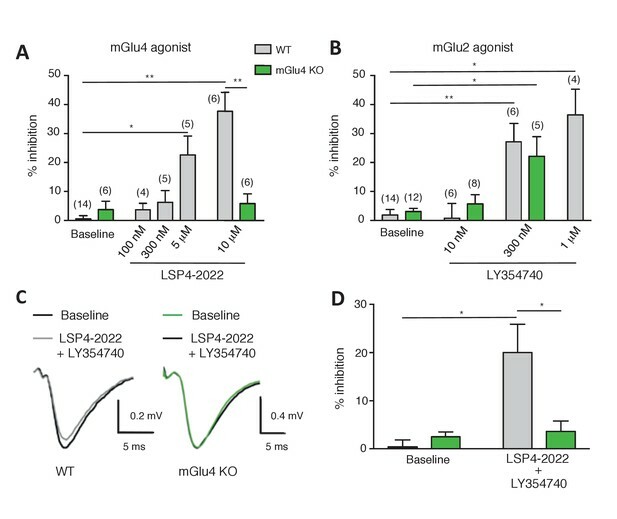 Under these optimized conditions (40 ng CLIP-mGlu2 and 20 ng SNAP-mGlu4), the measure of the inhibition of cAMP production revealed a partial activity of the mGlu4 agonist L-AP4 and a slight loss in potency of the mGlu2 agonist LY379268 (Figure 1—figure supplement 1D–F), as reported by others (Yin et al., 2014). 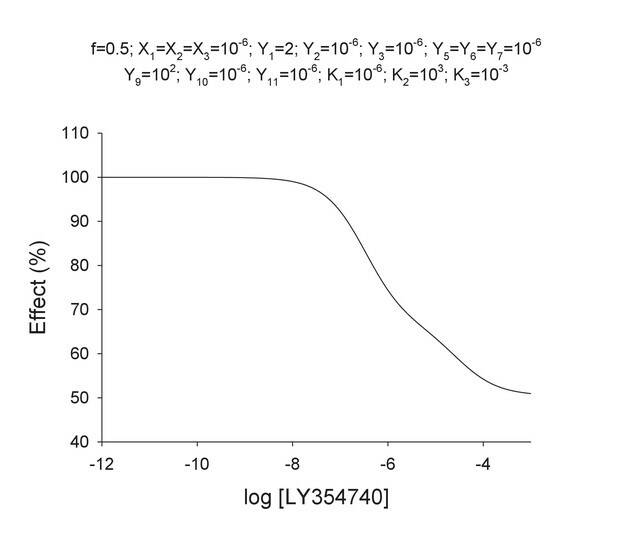 Of note, the L-AP4 dose-response curve in cells expressing both mGlu2 and 4 subunits can be fitted with a biphasic curve (Figure 1—figure supplement 1F), an effect consistent with the action of L-AP4 on both mGlu2-4 heterodimers and mGlu4 homodimers. This illustrates the difficulty of analyzing the specific properties of the heterodimer under such conditions. Phamacological profile of mGlu2, mGlu4 and mGlu2-4 receptors. (A) Schematic representation of TR-FRET mGlu sensors generated. (B–D) Specific effect on VFT rearrangement of the CLIP-CLIP mGlu2 (red), SNAP-CLIP mGlu2-4 (green) or SNAP-SNAP mGlu4 (blue) with increasing concentrations of the indicated compound. (E) Schematic representation of the C1-C2 expression control system used for a specific expression of mGlu2-4 heterodimers at the cell surface. (F–H) Specific detection of the inhibition of cAMP pathway using C1-C2 expression control system for mGlu2-4 (green), as well as wild-type mGlu2 (red) and wild-type mGlu4 (blue). Glutamate and the specific agonists of mGlu4 (L–AP4) and mGlu2 (LY354740) present similar pharmacological profile using both techniques. Results are mean ± SEM from three independent experiments performed in triplicates. To examine the effect of various agonists specifically on the mGlu2-4 heterodimer at the surface of live cells, we took advantage of the large conformational change observed at the level of the extracellular domain of mGlu dimers upon activation. This conformational change led to a drastic decrease in TR-FRET signal (Doumazane et al., 2013) that can be followed specifically in any of the three types of dimers at the surface of cells co-transfected with CLIP-mGlu2 and SNAP-mGlu4 (Figure 1A). Of note, the properties of one dimer combination were then analyzed in the presence of the others. In this assay, the glutamate potency was similar in the mGlu2-4 heterodimer and mGlu2 homodimer, higher than that on mGlu4 (Figure 1B), as previously reported by others (Yin et al., 2014). However, the potencies of the specific mGlu4 agonists were not increased in the heterodimer (Figure 1C; Figure 1—figure supplement 2A,B) suggesting no change in the affinity of mGlu4 ligands in the heterodimer. However, all of them acted as partial agonists within the mGlu2-4 heterodimer indicating that binding on the mGlu4 protomer only is not sufficient for a full activation of the heterodimer (Figure 1C; Figure 1—figure supplement 2A,B). This partial effect was more pronounced when activating mGlu4 with the partial agonist ACPT-I (Figure 1—figure supplement 2B). On the other hand, when activating the heterodimer with mGlu2 selective agonists, a loss in potency was observed in addition to the partial activity in the heterodimer (Figure 1D; Figure 1—figure supplement 2C,D). Interestingly, the mGlu2 agonist LY354740 displayed a strong loss in potency with a highly reduced slope (nH = 0.29) on the heterodimer (Figure 1D). The agonist APDC showed a right-shifted curve in the heterodimer in comparison with mGlu2 homodimer and half of the maximal response (Figure 1—figure supplement 2C). Of interest, DCG-IV, a high-affinity mGlu2 agonist and low-affinity mGlu4 antagonist, displayed a biphasic dose-response curve with a reduction of the response at higher concentrations (Figure 1—figure supplement 2D). We next aimed at verifying that the pharmacological mGlu2-4 properties observed using the TR-FRET conformational sensor correlate with those measured using a functional read out. To that aim, we used a quality control system allowing the cell surface targeting of the mGlu2-4 heterodimer only (Figure 1E). We replaced the C-terminal tails of the SNAP-mGlu4 and CLIP-mGlu2 with a quality control system based on the modified intracellular tails of the GABAB receptor subunits (called C1 and C2) (Brock et al., 2007; Huang et al., 2011). In that situation both homodimers are retained in the endoplasmic reticulum and do not reach the cell surface, and then are not capable of generating a signal as already reported for mGlu2 (Huang et al., 2011), and mGlu5 (Brock et al., 2007) receptors. In contrast, the coiled coil interaction between the C1 and C2-tails prevents the retention of each subunit, allowing the C1-C2 heterodimer to escape from the endoplasmic reticulum and reach the cell surface (Figure 1E) (see (Huang et al., 2011) for the characterization of the mGlu2-C1 and mGlu2-C2 constructs, and Figure 1—figure supplement 3 for the mGlu4-C1 construct). We set up the transfection conditions to avoid even the minimum leaking of the respective homodimers that might occur during the expression of these constructs and the absence of homodimer formation was checked by TR-FRET (Figure 1—figure supplement 3). The inhibition of forskolin-induced cAMP by mGlu2-4 receptors revealed data that perfectly match those measured with the TR-FRET sensor assay in terms of potency, Hill coefficient and efficacy (Figure 1F–H, Figure 1—figure supplement 2E–H). The potencies of the compounds tested in these different assays are indicated in Table 1. Potencies (pEC50) of the indicated compound on mGlu2, mGlu2-4 and mGlu4 as determined using the TR-FRET-based conformational assay depicted in Figure 1, or the cAMP assay as depicted in Figure 2. Data are means ± SEM of at least three experiments performed in triplicates. Taken together, these data revealed a low potency and low Hill coefficient for LY354740, which can be used as a first fingerprint of the mGlu2-4 heterodimer. To examine the role of each binding site in the activation of an mGlu heterodimer, we examined the effect of mutating either site. The substitution of the conserved Tyr and Asp by Ala in the glutamate-binding site of mGlu receptors (position 216 and 295 in mGlu2), which are called YADA mutants (Kniazeff et al., 2004; Brock et al., 2007; Doumazane et al., 2013), strongly impairs the binding of agonists. Accordingly, mGlu2YADA and mGlu4YADA homodimers, as well as the mGlu2YADA-4YADA heterodimer could not be activated by glutamate (Figure 2), despite their normal expression at the cell surface (Figure 2—figure supplement 1B,C). However, when a single subunit per heterodimer is mutated, glutamate maximal FRET change was about half the maximal response of the wild-type receptor (Figure 2B), consistent with a full activation requesting both binding sites occupied. As expected, no effect of the selective mGlu2 agonists could be observed in the mGlu2YADA-4 heterodimer (Figure 2D–F). 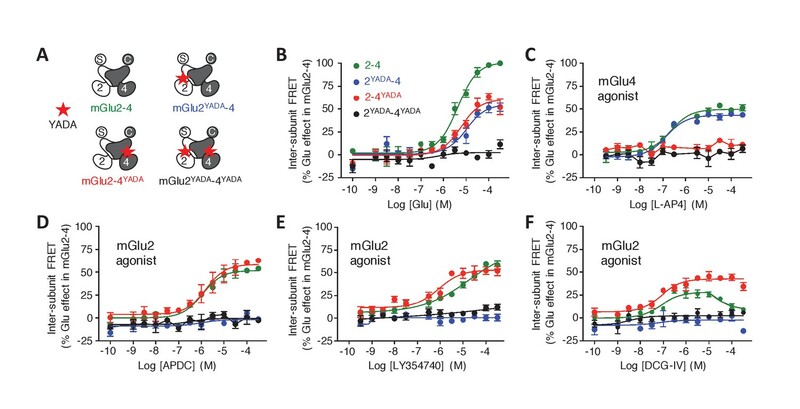 Similarly, selective mGlu4 agonists had no effect on the heterodimer mutated in the mGlu4 subunit (mGlu2-4YADA) (Figure 2C, Figure 2—figure supplement 1A), but mGlu2 selective agonists retained their activity (Figure 2D–F) on this mutant heterodimer. Of note, the Hill coefficient of LY354740 was increased to nH = 0.89 (Figure 2E), and the DCG-IV dose response curve was no longer biphasic, the decreased response obtained at higher dose not being observed in this mutated heterodimer (Figure 2F). These findings demonstrate the importance of an intact mGlu4-binding site in the complex pharmacological effect of the mGlu2 agonists LY354740 and DCG-IV on the mGlu2-4 heterodimer. Role of each binding site in agonist-induced activity of mGlu2-4. (A) Schematic representation of the mGlu2-4 mutants; wild type (green), YADA mutation in mGlu2 (blue), mGlu4 (red) or both (black). (B–F) Effect of increasing concentrations of the indicated ligands on the mGlu2-4 TR-FRET sensor. Results are mean± SEM of three independent experiments performed in triplicates. The above data prompted us to examine the influence of agonist binding in one subunit on the effect mediated through agonist binding in the second subunit. We observed that agonist binding in mGlu4 receptor increased the potency of mGlu2-specific ligands on the mGlu2-4 heterodimer (Figure 3A–C, Figure 3—figure supplement 1). 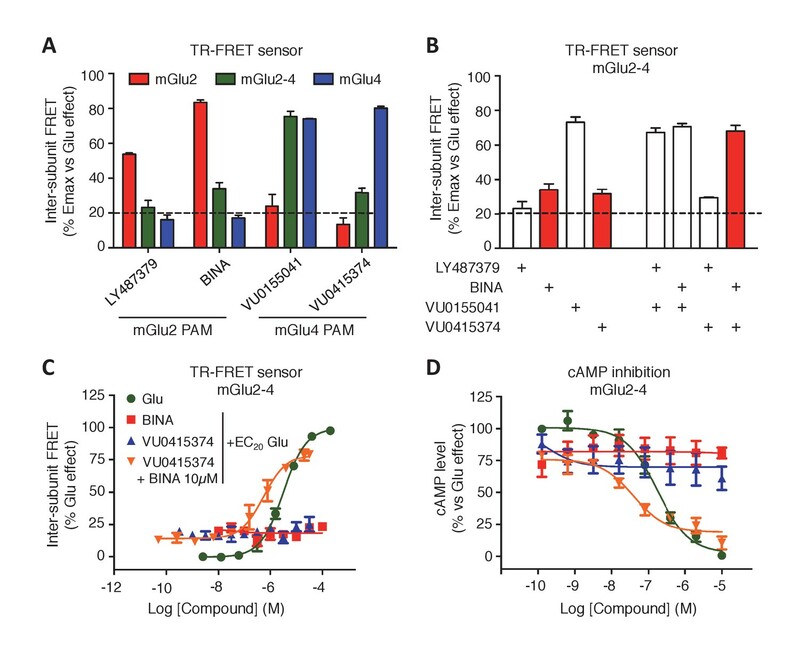 In the case of LY354740, not only mGlu4 agonists increased its potency, but also restored an nH close to unity, as observed with the TR-FRET conformational sensor (Figure 3A) and cAMP assays (Figure 3B,D). These results revealed a crosstalk between mGlu4 and mGlu2 protomers within the heterodimer, an effect that can be observed both at the level of the ECDs as revealed by the TR-FRET sensor, and at the G-protein coupling site. Synergistic action of mGlu2 and mGlu4 agonists in mGlu2-4 heterodimer. 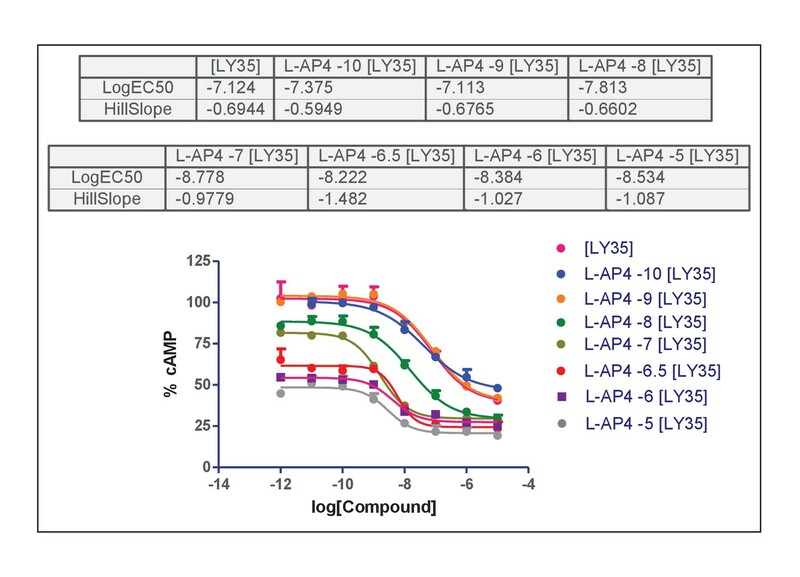 (A–B) Dose response curves of the mGlu2 ligand LY354740 in absence or presence of mGlu4 ligands (ACPT-I 10 µM, APcPr 3 µM, L-AP4 3 µM or LSP4-2022 3 µM) on the TR-FRET assay (A) and the inhibition of forskolin-induced cAMP production (B). (C–D) LY35740 EC50 (C) or Hill slope (D) in the presence of the indicated concentration of L-AP4. Results are mean ± SEM of three independent experiments performed in triplicates. Curve fitting was performed by using nonlinear regression. p-values<0.05 were considered statistically significant (*). 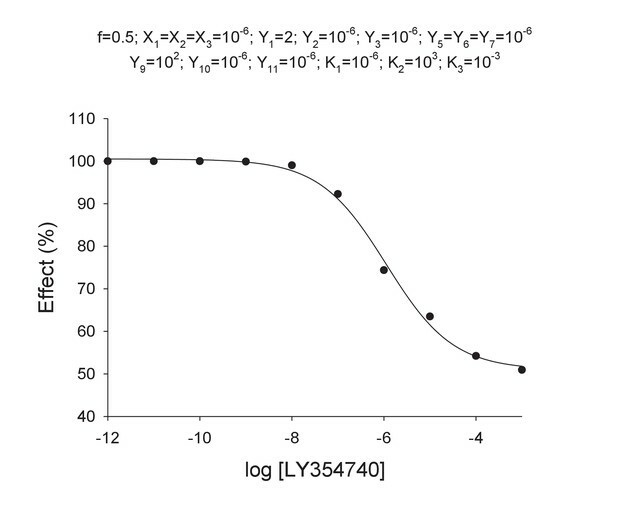 To quantitatively analyze the effect of mGlu4 agonists on the nH of LY354740 between ligands in the mGlu2-4 heterodimer, mathematical models were developed (Figure 3—figure supplement 2A,B). 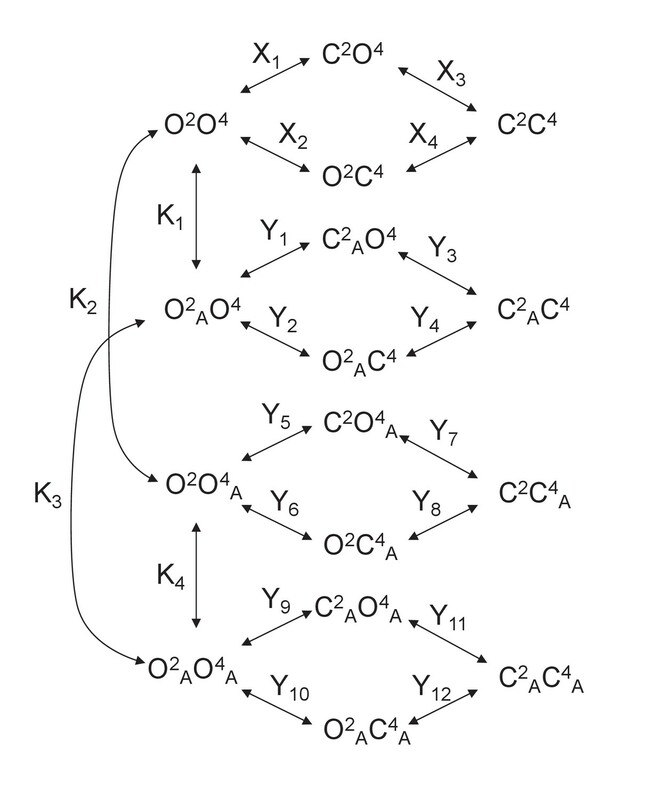 Assuming that mGlu2 and mGlu4 ligands bind to their respective protomers exclusively (Model 1), the mechanistic model collapses to an empirical model that can be expressed as a Hill equation with a Hill coefficient of 1 (see Appendix 1). This is not consistent with the flat slope curves displayed by LY354740 and the cooperativity exerted by mGlu4 ligands. In a second model, we then assumed that LY354740 could bind to mGlu4 VFT, with a very low affinity in mGlu4 homodimers, but with a higher affinity in the mGlu4 subunit of the mGlu2-4 heterodimer due to its binding on mGlu2 VFT. For a best fitting of the LY354740 curve (Figure 3—figure supplement 2C), we had to assume the closed-closed state is not fully achieved because the ligand behaves as a partial agonist. In addition, two components of the functional activity had to be set up, one related with the binding to a first VFT of the heterodimer and another one related to the binding to the second protomer. Eventually, we had to assume that LY354740 binds the mGlu4 protomer after occupying first the mGlu2 binding site. This model is then consistent with L-AP4 binding in the mGlu4 VFT increasing LY354740 potency and restoring a Hill coefficient close to unity (see Appendix 1). The synergistic effect between mGlu2 and mGlu4 agonists constitutes a second fingerprint of the mGlu2-4 heterodimer that may be useful for the identification of mGlu2-4 in neurons. Positive allosteric modulators (PAMs) can enhance both agonist affinity and efficacy. They can also have an intrinsic agonist activity on mGluRs (Conn et al., 2014). Using our TR-FRET mGluR conformational sensors, we found that the mGlu2 PAMs, BINA and LY487379 potentiate the effect of glutamate (at its EC20) in the mGlu2 homodimer, but very weakly in the mGlu2-4 heterodimer and not at all in mGlu4 (Figure 4A). Regarding the mGlu4 PAMs, VU0155041 activated both mGlu4 and mGlu2-4 while VU0415374 potentiated mGlu4 homodimer mainly (Figure 4A), as previously reported (Yin et al., 2014; Niswender et al., 2016). Co-application of mGlu2 and mGlu4 PAMs led to specific effects on the mGlu2-4 heterodimers, depending on the PAM used. Neither BINA nor VU0415374 had any effect when applied alone on the glutamate EC20 mediated response (Figure 4B–D). However, a clear and strong potentiation of the glutamate EC20 response was observed when both PAMs were applied together (Figure 4B–D). This synergistic effect was not observed with another combination of PAMs (Figure 4B). The synergistic action of BINA and VU0415374 was also observed in a functional cAMP assay (Figure 4D) and constitutes therefore a third fingerprint for the mGlu2-4 heterodimers. Synergistic action of mGlu2 and mGlu4 PAMs in mGlu2-4 heterodimer. (A) Effect of mGlu2 (LY487379 10 µM, BINA 10 µM) and mGlu4 (VU0155041 10 µM, VU0415374 10 µM) PAMs on mGlu2 (red), mGlu4 (blue) and mGlu2-4 (green) TR-FRET sensors in the presence of an EC20 of glutamate. (B) Effect of mGlu2 and/or mGlu4 PAMs on the response mediated by an EC20 concentration of glutamate in mGlu2-4 heterodimer by TR-FRET. The strong synergy between BINA and VU0415374 is highlighted with red bars. (C–D) Dose response of BINA and/or VU0415374 in potentiating the effect of EC20 glutamate on TR-FRET sensors (C) and cAMP inhibition (D). Results are mean ± SEM of three independent experiments performed in triplicates. 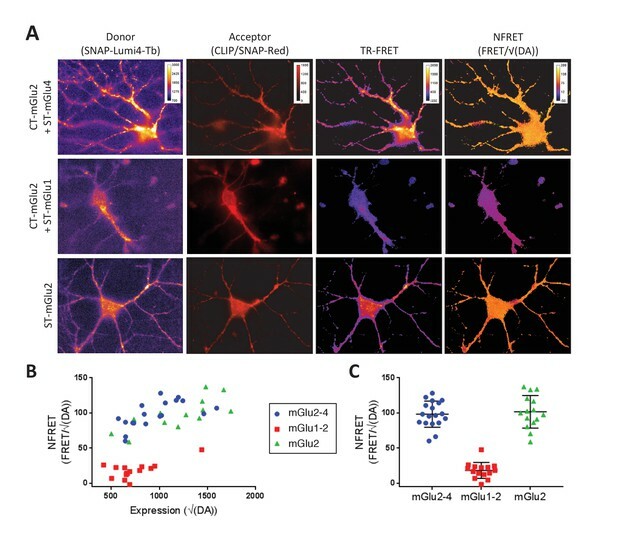 In primary cultures of hippocampal neurons, co-expression of CLIP-mGlu2 and SNAP-mGlu4 subunits could be detected at the cell surface through labeling with CLIP and SNAP substrates carrying either Lumi4-Tb or Red. In these neurons, using a lanthanide-based time-resolved FRET microscope that we recently developed (Faklaris et al., 2015), we detected a TR-FRET signal between the CLIP and SNAP subunits equivalent to that measured for homodimeric mGlu2 receptors. This observation is consistent with the formation of mGlu2-4 heterodimers in transfected neurons (Figure 5). In contrast, no TR-FRET could be detected between CLIP-mGlu2 and SNAP-mGlu1 (Figure 5), two subunits reported not to associate into heterodimeric entities (Doumazane et al., 2011; Levitz et al., 2016). Such mGlu2-4 heterodimers are not the consequence of a large over-expression of these tagged subunits, since their quantification using a mGlu2 specific antibody, relative to the endogenous mGlu2 revealed a five times higher expression of the tagged receptor only (Möller et al., manuscript submitted for publication). TR-FRET detection of mGlu2-4 heterodimers in transfected hippocampal neurons. Neurons transfected with CLIP-mGlu2 and SNAP-mGlu4 are compared with either CLIP-mGlu2 and SNAP-mGlu1 (negative control) or SNAP-mGlu2 (positive control). The receptors are labeled with Lumi4-Tb as donor and Red as acceptor. (A) Image examples of neurons expressing the three receptor combinations at comparable expression levels showing similar TR-FRET and NFRET (TR-FRET normalized to the expression of donor and acceptor) signals for the mGlu2-4 heterodimer and the mGlu2 homodimer and a low signal for the mGlu1-2 heterodimer. TR-FRET images are corrected for bleedthrough and thresholded to remove background and noise. Images are 138 µm wide. (B) Quantification of NFRET as a function of the expression level of donor and acceptor. Each point is the quantification of one neuron. (C) Scatter plot of NFRET. As a first attempt to identify native mGlu2-4 heterodimers in non-transfected cells, we used the striatal cell line STHdhQ7 (Trettel et al., 2000), since both mGlu2 and mGlu4 mRNA have been reported in the striatum, although to a low level (Ohishi et al., 1993; Conn et al., 2005; Ferraguti and Shigemoto, 2006; Gu et al., 2008; Beurrier et al., 2009). We first examined whether mGlu2-4 heterodimers can form in these cells upon transfection of CLIP-mGlu2 and SNAP-mGlu4. The formation of mGlu2-4 heterodimers was well illustrated by the cooperativity between the binding sites characteristic of the heterodimer, as revealed with the TR-FRET sensor assay (Figure 6—figure supplement 1). We then examined whether a native mGluR-mediated responses with the characteristics of the mGlu2-4 heterodimer could be detected in these cells. Unfortunately, the endogenous receptor levels are very low and the detection of their activation could not be detected using cAMP assays. However, we achieved measuring responses with mGlu2 and mGlu4 agonists using the xCELLigence technique, a label-free method reporting on small variations in cell shape (cell index). STHdh cells are shrunk when adenylate cyclase is activated (Figure 6A). 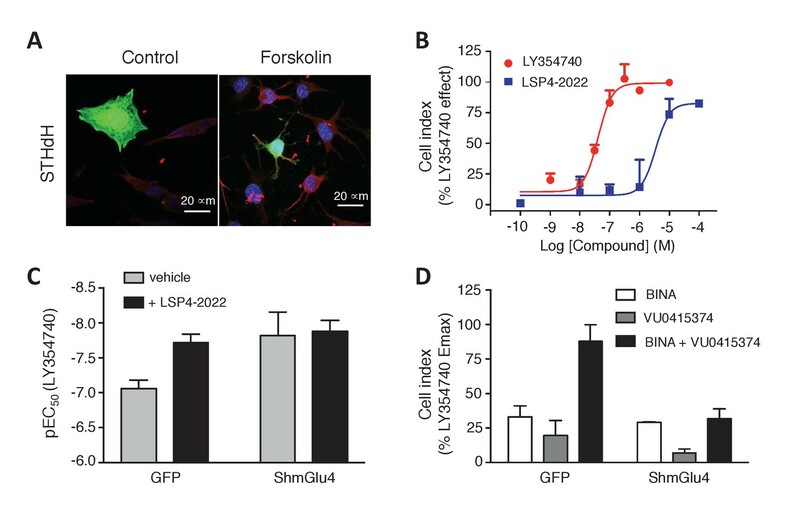 Taking advantage of this characteristic we observed that mGlu2- and mGlu4-specific ligands impaired the forskolin effect in a pertussis toxin-sensitive way, consistent with the presence of endogenous Gi-coupled mGlu2 and mGlu4 receptors in these cells (Figure 6—figure supplement 2). Both LY354740 and the mGlu4 preferential agonist LSP4-2022 (Goudet et al., 2012) produced a dose-dependent effect with the expected EC50s (Figure 6B). Functional evidence for mGlu2-4 heterodimers in a neuronal cell line, STHdh. (A) Representative image of neuronal cells treated or untreated with forskolin. Cells were transfected with GFP (green) and stained with MAP2 (red) and DAPI (blue). (B) Dose response on LY354740 or LSP4-2022 represented in % variation of cell index versus LY354740. (C) pEC50 values of LY354740 as determined using the change in cell index, in control cells transfected with GFP, and in cells transfected with the SH RNA against mGlu4, under control condition (gray bars) or in the presence of the mGlu4 agonists LSP4-2022 (10 µM). (D) Maximum effect of mGlu2 (BINA 1 µM) and/or mGlu4 PAM (VU0415374 1 µM) in potentiating the effect of low concentration of LY354740 (10 nM) and LSP4-2022 (100 nM) in control STHdh cells infected with GFP vector or silencing shRNA for mGlu4. Data in B–D are means ± SEM of three independent experiments performed in triplicates. As described above with the mGlu2-4 heterodimer (Figure 3), LSP4-2022 increased the potency of the mGlu2 agonist LY354740 (Figure 6B,C). This mGlu4 effect is clearly due to the presence of mGlu4 in these STHdh cells, since depletion of mGlu4 with a lentivirus expressing mGlu4 ShRNA, resulted in a higher potency of LY354740 consistent with its potency on mGlu2 homodimers, with no further effect of the mGlu4 agonist (Figure 6C). Furthermore, the synergistic effect of BINA and VU0415374 observed on the mGlu2-4 heterodimer (Figure 4) could also be observed in the STHdh cells (Figure 6D). Indeed, either BINA (1 µM) or VU0415374 (1 µM) modestly potentiated the effect of agonists (a combination of 10 nM LY354740 and 100 nM LSP4-2022), while a strong potentiation was observed with these two PAMs added simultaneously (Figure 6D). No such effect was observed in the mGlu4-silenced cells (Figure 6D). These data are consistent with the existence of mGlu2-4 heterodimers endogenously expressed in the STHdh cells. Effect of LY354740 and LSP4-2022 in the LPP of wild-type (WT) mice. (A) Bar graph illustrating the % inhibition of fEPSPs induced by low (100 nM and 300 nM) and high (5 µM and 10 µM) concentrations of LSP4-2022 in the LPP. Only high concentrations of LSP4-2022 induced a significant decrease of fEPSP amplitude. Green bars indicate data obtained using slices from mGlu4 KO mice. (B) Inhibitory effect of LY354740 on fEPSP amplitude in the LPP. Note that 300 nM or 1 µM LY354740 caused a significant decrease of fEPSP amplitude. Green bars indicate data obtained using slices from mGlu4 KO mice. (C) Representative averaged traces of evoked synaptic activity induced by LPP stimulation in field recording of granular cells from WT mice (Left). Bar graph illustrating the % inhibition of fEPSP amplitude by LY354740 (10 nM), LSP4-2022 (100 nM) and LY354740 (10 nM) / LSP4-2022 (100 nM) in the LPP (Right). Note that application of LY354740 (10 nM) + LSP4-2022 (100 nM) significantly decreased the fEPSP amplitude. Data in A-C are means ± SEM of (n) independent experiments from at least three different animals. *p<0.05, **p<0.001. In order to investigate whether mGlu2-4 heterodimers are expressed in these synapses, we applied a low concentration of each agonist that produced no detectable inhibitory effect in the LPP. Only when co-applied, LSP4-2022 (100 nM, 3.73 ± 2.19%, n = 4) and LY354740 (10 nM, 2.62 ± 3.83%, n = 5) induced a significantly large reduction of the fEPSPs in LPP (20.05 ± 5.82%; n = 6; Figure 7C). No such effect was observed in slices prepared from mGlu4 KO mice (Pekhletski et al., 1996) (Figure 7). The synergy of these agonists is consistent with the presence of mGlu2-4 heterodimers in these terminals. However, one cannot exclude a possible synergy between mGlu2 and mGlu4 at the signaling level, rather than within a heterodimer. We think this is unlikely since such strong synergistic effect have not been observed between Gi-coupled receptors. 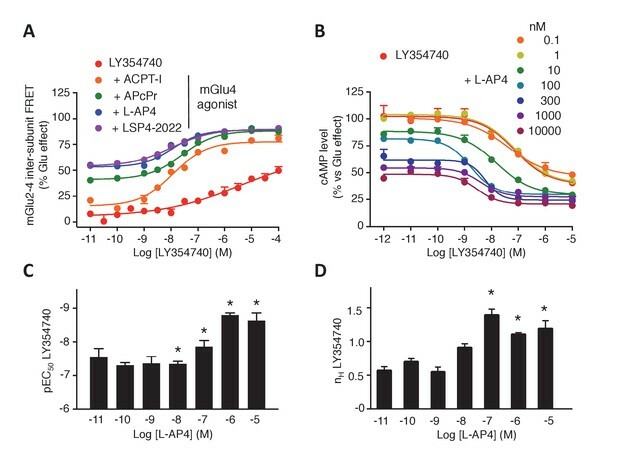 Indeed, upon co-expression of mGlu2 and the Gi-coupled delta opioid receptor (DOR), activation of DOR with SNC162 had no effect on the potency of LY354740 in inhibiting cAMP formation via mGlu2 receptors (Figure 7—figure supplement 1). Despite their description in heterologous cells 5 years ago (Doumazane et al., 2011), evidence for the existence of mGlu heterodimers in vivo remains elusive. Using two different approaches to characterize mGlu2-4 heterodimers specifically, we identified pharmacological fingerprints of such receptors. First, the mGlu2 selective agonist LY354740 behaves differently on the mGlu2-4 heterodimer than on the mGlu2 homodimer, including a lower potency, and a lower Hill coefficient. Such complex properties of LY354740 disappeared in the presence of mGlu4 agonists. Second, mGlu4 agonists largely increase the potency of LY354740. Third, among four mGlu2 or mGlu4 PAMs tested, only VU0155041 potentiated the effect of agonists on the mGlu2-4 heterodimer. Fourth, a combination of two PAMs (BINA and VU0155041) inactive when applied alone enhanced agonist action on the heterodimer when applied together. Such pharmacological fingerprints provide ways for demonstrating the existence of such heterodimers in native cells, as illustrated here with a neuronal cell line and the medial perforant path terminals in the dentate gyrus. One major difficulty in studying the functional and pharmacological properties of GPCR heterodimers is the ability of each subunit to form functional receptors, making difficult the measurement of signals originating from the heterodimers exclusively. In previous studies, properties of the mGlu2-4 heterodimers were studied in cells co-expressing both mGlu2 and mGlu4 (Yin et al., 2014). However, as illustrated in Figure 1—figure supplement 1, even when conditions were used for an optimal expression of the heterodimer at the cell surface, data obtained were always contaminated by responses mediated by the homodimers. In this study, we developed two different approaches that allowed the analysis of the pharmacological and functional properties of mGlu2-4 heterodimers, both strategies being likely useful for other class C heterodimers. Of note, the TR-FRET sensor assay that relies on the inter-subunit movement in mGlu dimers allows the specific analysis of compounds in any of the three combinations specifically. This allowed us to identify specific properties of the heterodimers that can be useful for the characterization of such receptors in native cells. Our data show that agonist occupancy of both subunits is required for a full activity of the heterodimer, as well illustrated using specific agonists of one subunit (either mGlu2 or mGlu4), or by mutating the binding site of either subunit. 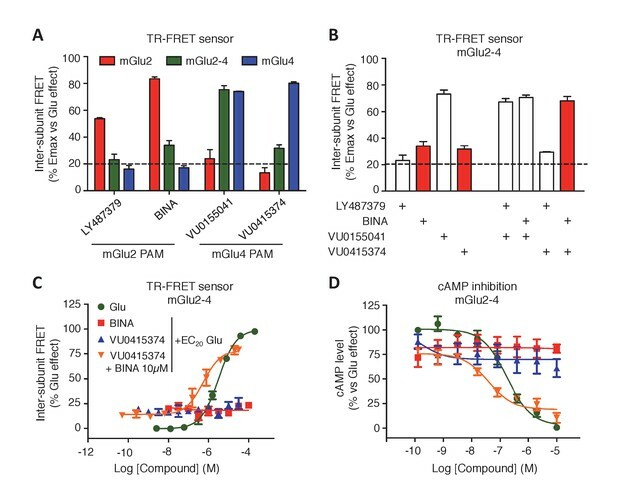 Accordingly, activating either the mGlu2 or mGlu4 VFT in the mGlu2-4 heterodimer leads to a similar partial effect, both at the conformational level of the VFT dimer, as revealed with the TR-FRET sensor assay, and at the signaling level. This finding is consistent with previous studies demonstrating that two agonists are required, with both VFT closed to fully activate mGlu5 homodimers (Kniazeff et al., 2004). However, it was reported that the low activity observed when a single protomer is occupied by an agonist in mGlu2 homodimers possibly results from the spontaneous closure of the second, unliganded VFT (Levitz et al., 2016). 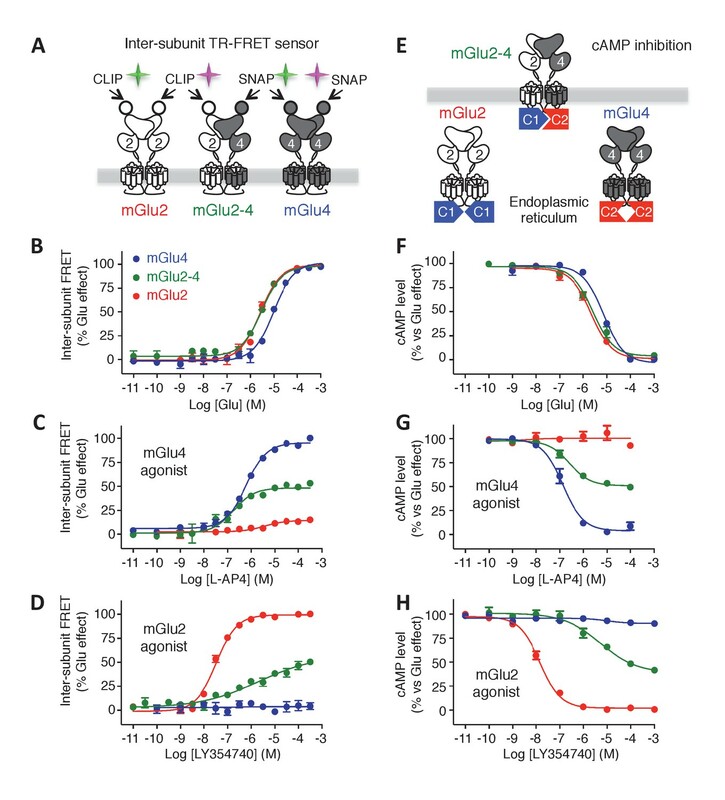 It is therefore possible that part of the activity observed with mGlu2 selective agonists on mGlu2-4 is due to a spontaneous closure of the mGlu4 VFT. This is consistent with the biphasic curve of DCG-IV, an mGlu2 agonist that has mGlu4 antagonist activity at high concentration. The effect of LY354740, a well-known group-II-specific mGluR agonist, appears quite complex on the mGlu2-4 heterodimer. This compound has a partial efficacy, but a low Hill coefficient on the heterodimer. Its mGlu2 potency and normal Hill coefficient are restored when the mGlu4 subunit is either activated or mutated to prevent ligand binding. These findings cannot be explained by a simple model in which both mGlu2 and mGlu4 ligands bind selectively to their respective subunit. Instead, our data suggest that LY354740 can bind to both subunits, its interaction with mGlu2 increasing its affinity to mGlu4 in the heterodimer. Such ligand cooperativity between bindings sites in an mGlu dimer has already been reported in mGlu5 receptors in which one binding site is mutated (Kniazeff et al., 2004; Rovira et al., 2008). The synergistic effect observed between mGlu2 and mGlu4 agonists appears as an interesting property to identify mGlu2-4 heterodimers in neurons. When examining the effect of two mGlu2 (BINA and LY487379) and two mGlu4 PAMs (VU0155041 and VU0415374), we confirmed that VU0155041 is the only PAM able to potentiate the effect of glutamate on the mGlu2-4 heterodimer (Yin et al., 2014). Although BINA and VU0415374 had very modest effects alone, their co-application largely potentiated the heterodimer. The structural basis for this synergistic effect, especially when considering that a single 7TM is active at a time in mGlu dimers (Hlavackova et al., 2005, 2012), remains unclear and will be the subject of further studies. Whatever the reason, this synergistic effect between these two PAMs offers another way to identify mGlu2-4 heterodimers in neurons. A recent study revealed that mGlu2-4 heterodimers are likely present in cortico striatal terminals (Yin et al., 2014). This conclusion is based on co-immunoprecipitation data, and on the lack of effect of PHCCC, an mGlu4 PAM devoid of effects in cells co-expressing mGlu2 and mGlu4, while VU0155041 that is active on both mGlu4 and mGlu2-4 heterodimers, potentiated the response (Yin et al., 2014). Our data also revealed that mGlu2-4 can form in transfected neurons, indicating there are no specific mechanisms in neurons that would prevent the formation of such heterodimers. Most importantly, we found that in a neuronal cell line, responses with the pharmacological characteristics of the mGlu2-4 heterodimers can be recorded. Indeed, the synergistic effects of mGlu2 and mGlu4 ligands (both agonists and PAMs) typical of the mGlu2-4 heterodimer were observed in these cells, bringing strong evidence that endogenous mGlu2-4 heterodimers exist in these neuronal cells despite the low expression of both mGlu2 and mGlu4. The synergistic activity of the agonists LY354740 and LSP4-2022 was also observed in the terminals of the medial perforant path in the dentate gyrus where both mGlu2 and mGlu4 subunits are present (Shigemoto et al., 1997). Such a synergistic activity is no longer observed in slices prepared from mGlu4 KO mice, demonstrating the involvement of mGlu4. However, we cannot rule out that such a synergy may come from the signaling cascades activated by both mGlu2 and mGlu4 homodimers. We still think this is unlikely because such a strong synergistic effect has not been observed between Gi-coupled receptors and indeed could not be observed between mGlu2 and the delta opioid receptor co-expressed in the same cells. It is sometimes argued that GPCR dimers and heterodimers result from the overexpression of the partners. For several reasons, this is unlikely the case for the mGlu2-4 heterodimer. Over-expression is expected to result in larger mGluR complexes since mGluRs are constitutive and covalent dimers (Calebiro et al., 2013), and no proximity could be detected by FRET between mGlu2 and mGlu1 receptors known not to form heterodimers (Doumazane et al., 2011), even in transfected neurons. The FRET efficacy between mGlu2 and mGlu4 largely decrease upon receptor activation, as expected for a correctly assembled dimer. The relative quantification of transfected over endogenous receptors revealed a fivefold only over-expression (Møller et al., manuscript in preparation). Various approaches have been used to estimate the size of the mGlu2-4 complex and all revealed a strict dimer (Doumazane et al., 2011). Eventually, a receptor with the pharmacological fingerprints of the mGlu2-4 heretodimer was observed in STHdh cells where both mGlu2- and mGlu4-mediated responses were difficult to detect, suggesting a low expression level. Taken together, our data add to previous studies suggesting the existence of mGlu heterodimers in the brain. We show that mGlu2-4 receptors likely exist in the brain and we report innovative approaches that will be useful to confirm the existence of other mGlu heterodimers. For example, one may propose the existence of heterodimers containing an mGlu7 subunit, for which the very low glutamate potency raised a number of questions regarding its roles in vivo. Indeed, mGlu7 can be found with other high-affinity mGluRs, such as mGlu8 (Ferraguti et al., 2005), offering a way to involve mGlu7 in a receptor heterodimer with specific properties. Proteomic experiments also identified mGlu5 as a partner of mGlu1 (Pandya et al., 2016), a finding that likely explains surprising functional studies regarding the effect of specific mGlu1 and mGlu5 inhibitors in the hippocampus (Huber et al., 2001; Volk et al., 2006). Functional studies also suggested mGlu3 receptors could be involved in heterodimeric entities with mGlu2 receptors (Iacovelli et al., 2009). A clear view of such mGlu heterodimers is definitively needed since all possible combinations observed in transfected cells suggest the existence of 16 additional receptor entities in the brain. In addition, first results are already highlighting specific roles played by homo and heterodimers in the actions of drugs with therapeutic potentials. For example, PAMs selective for the homodimeric mGlu4 may be preferred for the treatment of Parkinson disease (Niswender et al., 2016). Our study highlighting techniques to decipher the specific properties of mGlu heterodimers will definitively help solving these important issues. SNAP-Lumi4-Tb, SNAP-Green and CLIP-Green were from Cisbio Bioassays (Codolet, France). SNAP-block and CLIP-block were from New England Biolabs (Ipswich, MA, USA). (2R,4R)-APDC, ACPT-I, L-AP4, BINA, DCG-IV, LY341495, LY354740, LY487379, VU0155041 and SNC162 were purchased from Tocris Bioscience (Bristol, UK). LSP4-2022 was kindly provided by Dr. Francine Acher (Université Paris Descartes, France). VU0415374 was synthesized by Dr. Xavier Gómez and provided by Dr. Amadeu Llebaria (University of Barcelona, Spain). Control GFP and ShmRNA mGlu2 and mGlu4 lentiviral particles were purchased from Santa Cruz Biotechnology Inc. (Dallas, TX, USA). The mGlu4 KO mice were obtained from Dr David Hampson (Toronto, Canada [Pekhletski et al., 1996]), and their genotype determined as reported (Pitsch et al., 2007). The pRK5 plasmids encoding the wild-type rat mGlu subunits in which the SNAP or CLIP has been inserted at their N-term after the signal peptide, and constructs with YADA mutations in mGlu2 were previously described (Doumazane et al., 2011, 2013). The pRK5 plasmid encoding for the ligand binding deficient SNAP-mGlu4-YADA mutant in which the two residues Y230 and D312 important for agonist binding in the VFT were mutated, was generated by site-directed mutagenesis using QuikChange mutagenesis protocol (Agilent Technologies, Les Ulis, France) using the SNAP-mGlu4 plasmid as a template (Doumazane et al., 2011). The sequence coding C1 (the 47-residue coiled-coil sequence of the C-terminal of GABAB1), or C2 (the 49-residue coiled-coil region of GABAB2), followed by the endoplasmic reticulum retention signal KKTN, as previously described (Huang et al., 2011), was used to generate the constructs SNAP-mGlu4-C1 and CLIP-mGlu2-C2. SNAP-mGlu4-C1 was obtained by replacing the last 38 residues in mGlu4 C-term (SNAP-tagged version of mGlu4 was used) by C1KKTN. In this construct, the C-term of SNAP-mGlu4-C1 is …NKFTTGSSTNNNEEEKSRLLEKENRELEKIIAEKEERVSELRHLQSRQQLKKTN (the last residues (up to Thr874) of mGlu4 are underlined, those of C1 are in italic). The C-term sequence of CLIP-mGlu2-C2 was previously described (Huang et al., 2011). The plasmid encoding SNAP-delta opioid receptor was from Cisbio Bioassays. HEK293 cells (ATCC, CRL-1573, lot: 3449904) were cultured in Dulbecco’s modified Eagle’s medium (Thermo Fischer Scientific, Courtaboeuf, France) supplemented with 10% (vol/vol) fetal bovine serum (Sigma Aldrich) in a P2 cell culture room. Absence of mycoplasma was routinely checkedusing the MycoAlert Mycoplasma detection kit (LT07-318 (Lonza, Amboise, France), according to the manufacturer protocol. HEK 293 cells were used after 35 to 40 passages and transfected with a reverse transfection protocol using Lipofectamine 2000 (Thermo Fischer Scientific, Courtaboeuf, France), and finally plated in polyornithine-coated, black-walled, dark-bottom, 96-well plates at 105 cells/well. To avoid too high concentrations of glutamate in the assay medium that could interfere with mGluR activity, cells were cotransfected with the plasmid encoding the glutamate transporter EAAC1 and incubated in DMEM Glutamax medium (Thermo Fischer Scientific) at least 2 hr before the different assays were performed. Frozen-labeled HEK-293 cells were transfected as described above, labeled as described below, then frozen at −80°C with 10% DMSO and fetal bovine serum, and later washed three times in Krebs buffer (10 mM Hepes pH 7.4, 146 mM NaCl, 4.2 mM KCl, 1 mM CaCl2, 0.5 mM MgCl2, 5.6 mM glucose, bovine serum albumin (BSA) 0.1%) before use. In order to optimize the best expression of mGlu2-mGlu4 heteromers, several ratios of mGlu2:mGlu4 were assayed. It was determined by TR-FRET analysis that 2:1 ratio (40 ng CLIP-mGlu2: 20 ng SNAP-mGlu4) was optimal for the detection of all populations (Figure 1—figure supplement 1A–C). Using these conditions, a large batch of cells were transfected, labeled and frozen to perform a complete screening of the different compounds in 384-well plates. Conditionally immortalized wild-type STHdhQ7 striatal neuronal progenitor cell line (Trettel et al., 2000) were kindly provided by Dr Sílvia Ginés (University of Barcelona, Spain). These cells nicely differentiated and became MAP2 positive when cultured in a differentiated medium as described (Trettel et al., 2000). We also verified that they were still responsive to dopamine D1 and histamine H3 receptor agonists using the Xcellingence technology. Neuronal cells were grown at 33°C in DMEM (Sigma-Aldrich), supplemented with 10% fetal bovine serum (FBS), 1% streptomycin-penicillin, 2 mM L-glutamine, 1 mM sodium pyruvate, and 400 μg/ml G418 (Geneticin; Invitrogen). Neuronal cells were transfected with Lipofectamine LTX (Thermo Fischer Scientific, Courtaboeuf, France) following the protocol from the provider. To perform silencing of mGlu2 and mGlu4, STHdh cells were infected with control GFP vector, ShmRNA mGlu2 or mGlu4 vector and after 48 hr, infected cells were selected by adding hygromycin-containing medium. SNAP-tag labeling alone and orthogonal labeling of SNAP- and CLIP-tag were performed as described previously (Scholler et al., 2017). Briefly, for SNAP-tag labeling, 24 hr after transfection, HEK293 cells were incubated at 37°C for 1 hr with a solution of 100 nM of SNAP-Lumi4-Tb, 60 nM of SNAP-Green and 1 μM CLIP-block, in case of FRET detection between SNAP-tag subunits. For CLIP labeling, cells were incubated with 1 μM CLIP-Lumi4-Tb, 800 nM CLIP-Green and 1 μM SNAP-block. For co-labeling of the SNAP- and CLIP tags, cells were incubated at 37°C for 2 hr with a solution of 300 nM SNAP-Lumi4-Tb and 1 μM CLIP-Green. After labeling, cells were washed three times with Krebs buffer, and drugs were added. Then, the TR-FRET measurements were performed on a PHERAstar FS microplate reader (BMG Labtech, Ortenberg, Germany) which is standardly equipped with ‘TR-FRET’ optical modules and two photomultiplier tubes to detect two emission wavelengths representing donor and acceptor emission simultaneously, as previously described (Scholler et al., 2017). To monitor the emissive decay curves, the Lumi4-Tb present in each well was excited using N2 laser emission line at 337 nm (40 flashes per well for the 96-well plate format, 20 flashes per well for the 384-well plate format). The emission decay was collected during 2500 or 5000 μs with 5 μs or 10 μs steps, respectively, at 620 nm for the donor (Lumi4-Tb) and at 520 nm for Green, as can be indicated in the ‘advanced mode’ option of the plate-reader’s software. For acceptor ratio determination, optimal integration windows were determined as previously reported (Scholler et al., 2017). The acceptor ratio was calculated using the sensitized acceptor signal integrated over the time window [50 μs-100 μs], divided by the sensitized acceptor signal integrated over the time window [800 μs-1200 μs]. The amount of cAMP was determined using the GlosensorTM cAMP assay (Promega Corporation, Madison, USA). HEK293 cells were co-transfected with the indicated mGluR plasmids and the pGloSensor-22F plasmid. The day after, cells were starved during 2 hr in serum-free medium and afterwards incubated in Krebs buffer with 450 μg/ml luciferin (Sigma-Aldrich) during 1 hr. The luminescence peak signal was measured on a Mithras microplate reader at 28°C during 8 min since luminescence signal was stable. Then, forskolin plus mGluR ligands were added and luminescence was measured for 30 min. xCELLigence plates were coated with poly-ornithine and laminin during 1 hr, and neuronal cells were seeded at 3 × 104 cells/well and introduced into the incubator at 33°C overnight. Medium was replaced by serum-free medium during 2 hr to reach a stable cell index, and then forskolin and mGluR ligands were added and the signal was followed during at least 2 hr using xCELLigence RTCA DP apparatus (ACEA Bioscience Inc, San Diego, USA). When antagonists or PAMs were used, they were added 20 min before forskolin. Pertussin toxin was added 4 hr after cell plating and incubated overnight. Hippocampi from Sprague-Dawley rat embryos on embryonic day 18 (E18) were dissected, dissociated by treatment with liberase TL (Roche, Boulogne-Billancourt, France), then mechanical triturated and plated on Lab-Tek II chambered cover slides (Thermo Fisher Scientific) coated with poly-L-ornithine and laminin (Sigma-Aldrich) at a density of ~300 neurons/mm2. Neurons were cultured in Neurobasal medium (Thermo Fisher Scientific) supplemented with 2% B-27 (Thermo Fisher Scientific), 100 U/ml Penicillin-Streptomycin (Thermo Fisher Scientific), 10 mM HEPES, and 0.5 mM Glutamax medium (Thermo Fisher Scientific). 0.5 mM L-glutamine was added when plating the cells. Half of the medium was exchanged weekly. Neurons were transfected with Lipofectamine 2000 at 10 days in vitro (DIV). The medium was exchanged after 4 hr of incubation with the transfection reagent with half fresh medium and half medium conditioned by incubation with primary neurons. pRK5 plasmids for expression of SNAP- or CLIP-tagged rat mGluRs under control of the CMV promoter were previously described (Doumazane et al., 2011). For increased expression, the CMV promoter was exchanged with the synapsin-1 promoter (gift from B. Bettler) for CLIP-mGlu2 and SNAP-mGlu4. Homo- and heterodimers were expressed by co-transfection with CLIP-mGlu2 (100 ng/well) + SNAP-mGlu4 (200 ng/well), CLIP-mGlu2 (200 ng/well) + SNAP-mGlu1a (100 ng/well), or SNAP-mGlu2 (300 ng/well). For TR-FRET microscopy, 16–17 DIV neurons were labeled with 100 nM SNAP-Lumi4-Tb + 1000 nM CLIP-Red (heterodimers) or 100 nM SNAP-Lumi4-Tb + 500 nM SNAP-Red for 1 hr at 37°C in imaging buffer (10 mM Hepes pH 7.4, 127 mM NaCl, 2.8 mM KCl, 1.1 mM MgCl2, 1.15 mM CaCl2, 10 mM glucose) supplemented with 1% BSA followed by a wash in imaging buffer with 1% BSA and three washes in imaging buffer. Cells were imaged in imaging buffer. Images were acquired with a homebuilt TR-FRET microscope (Faklaris et al., 2015). Briefly, the donor was excited with a 349 nm Nd:YLF pulsed laser at 300 Hz with ~68 µJ/pulse followed by collection of either the donor signal using a 550/32 nm bandpass filter or the TR-FRET signal using a 700/75 nm bandpass filter. In both cases, images were acquired with 10 µs delay between excitation and collection of emission, 3 ms acquisition time and 4000 acquisitions. The acceptor was excited with a mercury lamp using a 620/60 nm bandpass filter, and the emission was collected for 300 ms with a 700/75 nm bandpass filter. Time-gated images were shading corrected by dividing the raw image with a background image using ImageJ version 1.51 f (Schneider et al., 2012). Correction for donor bleedthrough (6%) and generation of NFRET images (TR-FRET/(donor × acceptor)0.5) was done with the PixFRET plugin to ImageJ (Feige et al., 2005). Acceptor bleedthrough and direct acceptor excitation was not detected. For quantification, all non-zero pixels in the NFRET image were selected, pixels not belonging to the cell removed and the modal NFRET value and mean donor signal were measured for this selection. Acute slices were prepared from adult (P21-P30) control or mGlu4-KO mice following a protocol approved by the European Communities Council Directive and the French low for care and use of experimental animals. Mice were decapitated, and brains quickly removed and chilled in cold artificial cerebro-spinal fluid (ACSF) containing 125 mM NaCl, 2.5 mM KCl, 1.25 mM NaH2PO4, 25 mM NaHCO3, 1 mM MgCl2, 2 mM CaCl2, and 10 mM glucose, pH 7.4, equilibrated with 95% O2 and 5% CO2. Parasagittal acute 400-µm-thick slices were prepared with a vibratome (7000 smz, Campden Instruments LTD, England) in ice-cold ACSF. Sections were kept at room temperature for at least 1 hr before recording. Slices were transferred to a submersion recording chamber, maintained at 30°C and perfused with oxygenated ACSF at a rate of one chamber volume (1.5 ml) per minute. fEPSPs were evoked at 0.033 Hz using bipolar stimuling electrode and recorded using glass micropipettes (3–5 MΩ) and filled with 3 M NaCl. Stimuling electrode was placed in the outer thirds of the molecular layer of the dentate gyrus for stimulation of the lateral perforant path (LPP). Correct positioning of electrodes was verified by application of paired-pulse at an interval of 100 ms induces paired-pulse facilitation in the LPP. The effect of paired-pulse stimulation was assessed and only those slices that displayed the correct facilitation in the LPP were used for this study. Input-output curves were generated for each slice, and the stimulation intensity was adjusted to 70% of the maximum response. Baseline fEPSPs were recorded for a minimum of 20 min before bath-application of different agonists or PAMs. Evoked responses were analyzed by measuring the slope of individual fEPSPs. The slopes from two sequential sweeps were averaged. All slopes were normalized to the average slope calculated during the pre-drug period (percentage of baseline). All data were analyzed offline using pClamp 9 (Molecular Devices) and are reported as the mean ± SEM. Statistical comparisons were made using two-tailed unpaired or paired Student’s t-tests. Differences were considered significant at p<0.05. The % inhibition was calculated by the difference of the slope between the baseline and the last 4 min of the drug application. SAS/STAT 9.4 (SAS Institute, Cary, NC, USA) statistical package was used for parameter optimization and statistical analyses in mathematical modeling. Curve fitting was performed using nonlinear regression using GraphPad Prism software. p-values<0.05 were considered statistically significant using one-way ANOVA with Bonferroni post-hoc test. Concentration-effect results from our experiments were selected for further analysis with a mathematical model. We consider strict mGlu2-4 heterodimers. As we are considering agonists we will focus on the ECDs of the dimeric receptor. Two states either open (O) or closed (C) can be reached by each of the ECDs which can lead to heterodimers arranged as OO, OC or CC dimeric states. We will consider that if all heterodimers were in OO then a functional effect (F) value of 100 would be obtained whereas if they were all in CC an F value of 0 would be observed. Consistently, we assume that OC yields an intermediate value between 0 and 100. LY35 binds exclusively the mGlu2 protomer whereas L-AP4 binds exclusively the mGlu4 protomer. With 0 < f < 1. We consider that OO states produce 100% F, CC states produce 0% F and OC states produce 0 < F(%)<100. It can be shown that Equation 4 can be written as the typical Hill equation with a Hill coefficient of one (Equation 5). The basal response (when [A] = 0) is defined by Top=100a1a3=100ac=1001+f(X1+X2)1+X1+X2+X1X3. Consistently with basal definition there is no constant related with the agonist A. The minimum response, that is the asymptotic response as [A] increases, is defined byBottom=100a2=100bd=1001+f(Y1+Y2)1+Y1+Y2+Y1Y3. Bottom determines the efficacy of the ligand. . Consequently, the dissociation constant for binding is not present. A full agonist mGlu2 in the heterodimeric context would be one with a high Y3, which leads to the formation of C2AC4, that is both protomers are closed. Obviously, if we perform the concentration-response curve of the mGlu2 agonist in the presence of an mGlu4 agonist the closing of the mGlu4 subunit is facilitated, which affects both Top and Bottom. The location of the curve along the X=log[A] axis is defined byx50=loga3=logcd=log1+X1+X2+X1X31K1(1+Y1+Y2+Y1Y3). Consistently with potency definition, values related with efficacy (Y constants) and affinity (K1constant) are present. Finally, from the slope parameter point we conclude that the proposed mechanistic model with LY35 binding exclusively to mGlu2 and L-AP4 binding exclusively to mGlu4 produce Hill curves with Hill coefficients of one. The model can be used for the function of an agonist mGlu4 in the presence of fixed concentrations of an mGlu2 agonist. Experimental data curves were fitted with Hill equations with nH = 1 and with nH allowed to be different from 1. To assess whether nH is statistically different from one different tests can be done. Hill equation parameters resulting of fitting curve data in Appendix 1—figure 1. Concentration-effect curves of LY35 in the presence of L-AP4. Addition of mGlu4 agonist displaces the curves downwards because closing of the mGlu4 protomer decreases F. Interestingly an apparent influence on the slope of the curves is observed: The Hill coefficient is less than one when L.AP4 is absent or at low concentration and increases to one at higher L-AP4 concentration. We analyze whether nH is statistically different from one in two ways. 1.We fit each of the curves with equation F(%)=Bottom+Top−Bottom1+10nH(x−x50) and calculate the confidence interval at 95% for m parameter. Curves with [L-AP4]≤10−7 present nH <1 in average with some of them (10−10, 10−8) reaching statistical significance (the confidence interval of the nH parameter is below 1) and one of them (10−9) very close to be statistically significant. 2.We fit the collection of curves (3 or 2) for each L-AP4 concentration with two equations F(%)=Bottom+Top−Bottom1+10nH(x−x50) and F(%)=Bottom+Top−Bottom1+10x−x50 and analyze with an F-test of the sum of squares errors whether the model including the nH parameter provides a better fit than that in which nH is not present. Statistical comparison of goodness of fit including the slope parameter (nH) or not to curves displayed in Appendix 1—figure 1. Results are consistent with the previous analysis, the model including the slope parameter improves significantly the fitting for [LAP4] = 10−10 and 10−8 and close to significance for [LAP4] = 10−9. The mechanistic model depicted in Appendix 1—figure 2 yields an empirical Hill equation with a Hill coefficient of 1. Experimental data suggest that the binding of LY35 to the heterodimer produces curves with Hill coefficient lower than one at low [L-AP4] and curves with Hill coefficient not different from one at high [L-AP4]. Thus, apparently, there is a contradiction between the mechanistic model and those results with the slope parameter lower than one. A heterodimeric mGlu2/4 model in which an mGlu2 agonist binds exclusively the mGlu2 protomer. 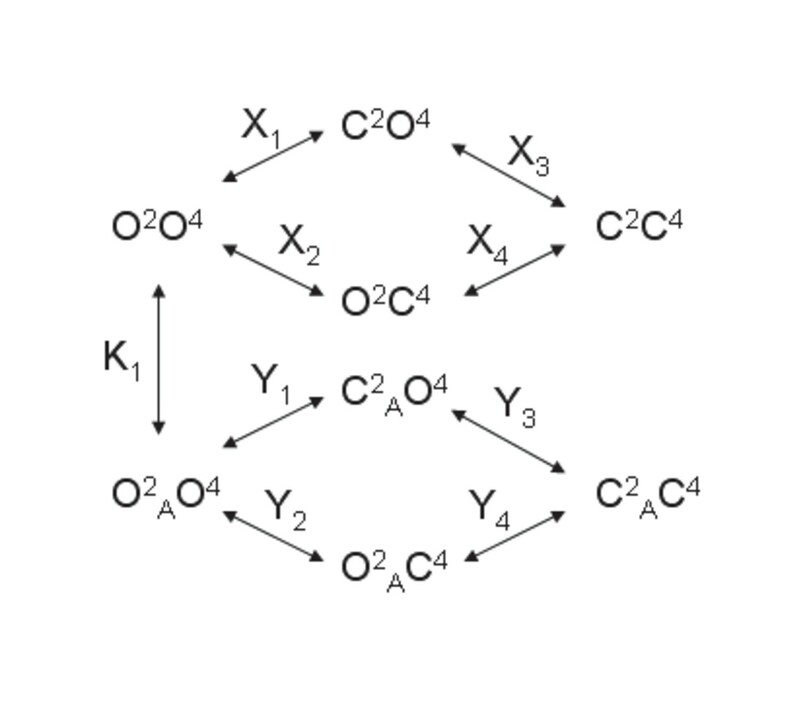 The binding of an mGlu4 ligand to mGlu4 alters the constants of the model. A slope parameter lower than one could be explained assuming that LY35 binds at both mGlu2 and mGlu4 subunits in the heterodimer with crosstalk between them. Addition of mGlu4 agonist L-AP4 precludes the binding of LY35 to mGlu4 subunit and converts the heterodimeric receptor in a monomeric receptor for LY35. 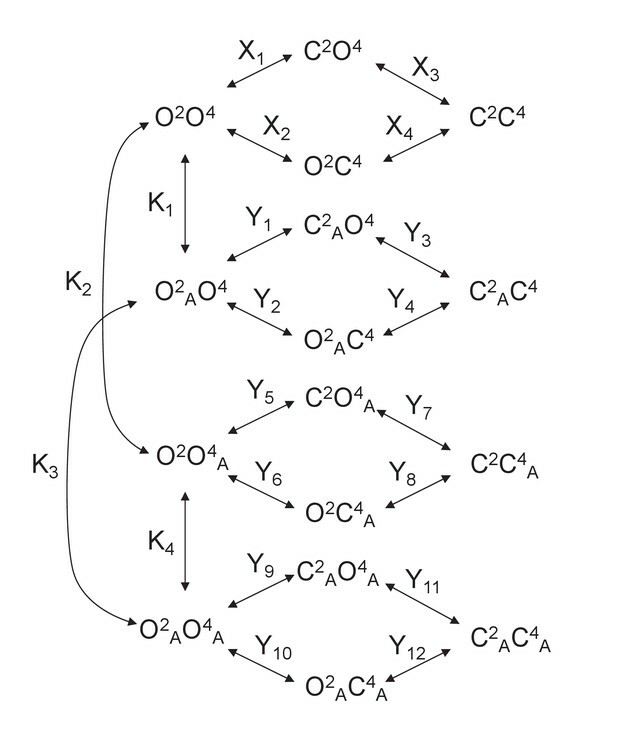 To account for concentration-effect curves with a Hill coefficient different from one the model displayed in Appendix 1—figure 2 was extended by allowing the possibility that LY35 could bind the mGlu4 protomer in addition to the mGlu2 one (Appendix 1—figure 3). A heterodimeric mGlu2/4 model in which an mGlu2 agonist binds both the mGlu2 and the mGlu4 protomers. The additional binding of an mGlu4 ligand alters the constants of the model. The empirical ci coefficients reflect, when expressed as combination of mechanistic constants, what we would expect from the comparison between Equation 8 and Appendix 1—figure 3. That is, c1 and c4 include equilibrium constants related with free receptor species only. Analogously, c2 and c5 include equilibrium constants related with receptor species with only one bound agonist whereas c3 and c6 include equilibrium constants related with receptor species with two bound agonists. Of note, the relationships between the empirical coefficients determine the shape of the concentration-effect curves (see below for shape quantification). If we divide the numerator and denominator of Equation 8 by c6 we have Equation 9. With ai=ci/c6 for i = 1 to 6. Equation 9 is an empirical equation for a ligand that binds to two receptor sites. This equation has been previously derived from some mechanistic models involving two receptor binding sites (see 1,2 as examples and reviews 3,4). The shape of the concentration-effect curve determined by Equation 9 can be quantitatively characterized by the following geometric determinants. Consistently with basal definition there is no constant related with the agonist A. Because 0<f < 1, Top will be always lower than 100. Furthermore, as higher is X3 (the propensity to form CC states) lower is Top. Bottom determines the efficacy of the ligand. Considering the mechanistic constants included in Bottom definition, it follows that a3 <1. A ligand is a full agonist if a3< < 1 and a partial agonist if a3 <1. In agreement with Bottom defined as efficacy, the dissociation constants for binding are not present in its mechanistic expression. A full agonist mGlu2 in the heterodimeric context would be one with a high Y11, which leads to the formation of C2AC4A, that is, both protomers are closed. Obviously, if we perform the concentration-response curve of the mGlu2 agonist in the presence of an mGlu4 agonist the closing of the mGlu4 subunit is facilitated, which affects both Top and Bottom. Consistently with potency definition, values related with efficacy (Y constants) and affinity (Ki constants) are present. With y=F(%), x = log[A]; a, the Bottom; ln, the natural logarithm; and d/dx, the derivative operator as expressed in Equation 14. The value of the Hill coefficient as obtained from Equation 13, with empirical coefficients (a1 to a5), which in turn are defined in terms of mechanistic equilibrium constants, may provide a mechanistic interpretation to the Hill coefficient obtained by fitting with the empirical Hill equation including the slope parameter. The ratio c1/c4 determines the Top asymptote (basal response) and the ratio c3/c6 determines the Bottom asymptote (efficacy). The ratio c2/c5 determines the sensitivity of the measured effect to agonist concentration. Considering the mechanistic constants included in c2 and c5 definition, it follows that c2 <c5. The induction constants that appear in c2 and c5 expressions are Y1, Y2, Y3, Y5, Y6 and Y7, which are those constants affecting receptor species with only one molecule of mGlu2 agonist present. We see that Y3 and Y7 are present in c5 but not in c2; then, the values of these constants may modulate the c2/c5 ratio. Because of the closure of the thermodynamic cycles included in the model displayed in Fig. S3, Y4 and Y8 (Y4=Y1Y2Y3, Y8=Y5Y6Y7) can be used instead of Y3 and Y7, respectively. The pair (Y3, Y7) or the pair (Y4, Y8) measure how the closure of one protomer favors the closure of the other thus it can be considered as a measure of functional cooperativity. Thus, we can conclude that the functional cooperativity between the two protomers affects the sensitivity of the measured effect and be the cause of some of the flat curves observed. Equation 9 contains five parameters and is difficult to fit to curves that do not display a clear biphasic shape. However it may be used for modeling different pharmacological conditions by assigning particular values to the parameters. Appendix 1—figure 4 illustrates how Model two can explain the flat curve observed for LY35 mGlu2 agonist. We assume that the closed-closed state is not achieved by proposing the induction constants Y3 = Y7 = Y11=10−6. These constants make LY35 to behave as a partial agonist with a bottom value of 51%. We assume that there is negative binding cooperativity and the ligand binds the mGlu4 protomer after occupying first the mGlu2 binding site (K1 = 10−6; K2 = 103; K3 = 10−3). This leads to a curve with two components, one related with the binding of the first molecule to the heterodimer and another one related with the binding of the second molecule. The induction constant for the closure of the mGlu2 subunit is greater in the doubly- than in the singly-bound heterodimer (Y9 >Y1). A f-value of 0.5 was used for the functional closed-open state. Theoretical concentration-effect curve for particular values of the mechanistic constants included in Model 2. The theoretical concentration-effect data are the following. Data extracted from concentration-effect curve of Appendix 1—figure 4. Curve data included in Appendix 1—table 4 (solid points) and the theoretical curve by using the Hill equation parameters of Appendix 1—table 5 (curve line). The Hill coefficient nH is ~0.6 in agreement with experimental data. The following graph includes the theoretical data from Model two and the curve produced by using the Hill equation fitted parameters. Parameter values by fitting curve data in Appendix 1—table 4 with the Hill equation. The Journal of Comparative Neurology 407:33–46. Annual Review of Pharmacology and Toxicology 37:205–237. Microscopy Research and Technique 68:51–58. Cell and Tissue Research 326:483–504. Trends in Pharmacological Sciences 24:63–65. Progress in Molecular Biology and Translational Science 115:349–373. Trends in Pharmacological Sciences 20:396–399. Annual Review of Pharmacology and Toxicology 50:295–322. Advances in Experimental Medicine and Biology 796:159–181. Journal of Biological Chemistry 271:28612–28616. Journal of Pharmacology and Experimental Therapeutics 325:443–456. Trends in Pharmacological Sciences 31:15–21. Thank you for submitting your article "Pharmacological evidence for a metabotropic glutamate receptor heterodimer in neurons" for consideration by eLife. Your article has been reviewed by three peer reviewers, one of whom is a member of our Board of Reviewing Editors, and the evaluation has been overseen by Richard Aldrich as the Senior Editor. The following individuals involved in review of your submission have agreed to reveal their identity: Robert Duviosin (Reviewer #3). The manuscript was evaluated by knowledgeable referees, who provided positive comments about the findings of a mGluR2-4 heterodimer. Using a time resolved FRET based approach, strong evidence was provided for a heterodimeric arrangement of mGlu2-4 in HEK293 cells and primary neurons after transfection experiments. Agonists of mGlu2 were used to define the responses and cooperativity of the Glu2-4 heterodimer with a determination of the Hill coefficient. Several reservations were raised, including (1) the relevance of the findings to the endogenous receptor; (2) the need for additional data in neuronal systems where mGlu2-4 receptors are found; and (3) a number experimental details need to be clarified and rectified throughout the manuscript. It was felt that the Background and Materials and methods require more explanation, since the methods represent a new way of demonstrating heteromer interactions. We feel that the majority of these issues can be addressable in a timely fashion and recommend a major revision for this paper. The major concerns are listed below. Although the analysis is compelling, the study would be strengthened if the transfection experiments excluded the effects of overexpression and miss localization of the receptors. 1) An expression system is used to follow the mGlu2-4 heterodimers at the cell surface, but this does not exclude an intracellular localization of the receptors. Also, strong promoters were used to gain high expression levels in HEK293 and primary hippocampal neurons. Some attention should be given to appropriate cellular expression after transfection. The images in Figures 5 and 6 are adequate, but do not indicate if there is are differences in subcellular localization after transfection. 2) A SThdHQ7 striatal cell line is used to follow mGlu2-4 receptors. Why do the cells shrink after activation of adenylate cyclase (Results section)? There is not a good explanation for why these cells are chosen. What is the relevance of mGlu2-4 to striatal disorders, such as Huntington's disease? 3) How is "minimum leaking of respective homodimers" determined? A definition of the "orthosteric binding site" of mGluR (subsection “Activation of both subunits in mGlu2-4 receptor is required for full activity”) would be helpful. 4) The stoichiometry of many other receptor systems has been deduced from affinity crosslinking experiments. Given all the tools available to the laboratory, this is an accessible experiment and would provide more evidence for the heterodimer model. In this manuscript the authors examine heterodimerization between metabotropic glutamate receptor types in modulating receptor activity. The majority of the studies are carried out with recombinant receptors- while the studies are solid and address an important question, a cursory effort has been made to characterize the native receptors. The authors use primarily heterologous or neuronal cell lines and FRET-based techniques to explore the changes in movement of the receptors upon ligand binding. They go on to explore the regulation of signaling altered by this process. The studies are well thought out and executed and conclusions are based on solid data. In sum, the majority of the studies are carried out with recombinant receptors expressed in heterologous cells or cultured neurons – while the studies are solid and address an important question in the field, how relevant this information is to the native receptor in an endogenous setting is not well explored. 1) Title – as written the title makes a sweeping claim that is only partially addressed and so is misleading. 2) Abstract – This is written in rather general terms and reads like conclusions rather than the synopsis of the study. Expanding the Abstract to include a bit more information as to the major findings of the study would help. 3) Materials and methods – More details need to be included in this section and some important details are missing; for example, details of the receptors (including species) transfected into neurons is not included here (it appears in the Figure legend). How the ER-retaining receptors were generated, characterized and independently tested so that only heteromers appear at the cell surface is not clear. Authors are encouraged to show this data as it would strengthen their argument that only heteromers are expressed at the cell surface. These are only a couple of examples and the authors are should carefully go over each of the experiments in the manuscript to ensure that all of the methods are clearly described rather than having the reader go back and forth between the Materials and methods and the figure legend section. 1)Subsection “A FRET-based sensor to identify mGlu2-4 specific fingerprints”: As written it appears that the concentrations of SNAP-donor and CLIP-acceptor substrates that gave a signal for the heteromer did not give a TR-FRET signal with respective receptor homomers – is this true? This needs to be clarified in the manuscript. 2). 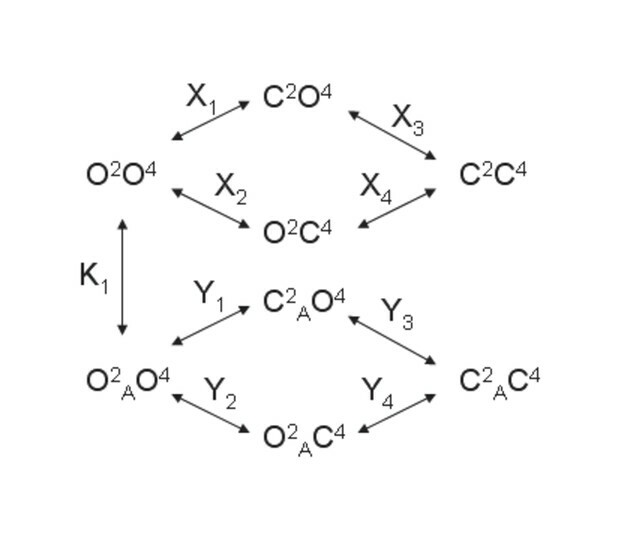 In the same subsection, paragraph two: Figure 1A is a schematic representation of how homomers and the heteromer are tagged; this figure does not show the decreases in TR-FRET as it is described in the text. Appropriate panels showing the actual data need to be referenced (not a schematic). 3)A table with potencies, efficacies, Hill coefficient with the different ligands in cells expressing homomers and heteromers would be useful as it would enable the reader to compare changes instead of going through different figures to check out statements made in the text. 4)Figure 7 contains one panel that addresses the physiological relevance of the findings in this study. A combination of agonists (albeit at a single concentration of each) give more than an additive response when compared to the responses to the individual agonists. However, the error bars are high and it is not clear how many cells were examined and from how many animals (this should be in Figure legend). In the figure legend the number of (n) independent experiments not provided. 5) Also a dose response curve of either LY34540 (or LSP4-2022) in the presence of a low dose of LSP4-2022 (or LY34540) would have strengthened this crucial point. 6) Figure 1—figure supplement 1A-C what do the different colors in the plots mean. How do they help differentiate homomeric from heteromeric signals? 7. )There is a mismatch between the title of the figure and figure legend – the authors are requested to check this carefully. For example, legend on Figure 1—figure supplement 1A says mGlu4 but title of figure says mGlu2, legend for Figure 1—figure supplement 1B says mGlu2 but title of figure says mGlu4. Similarly in Figure 1—figure supplement 2A and B title in the figure says mGlu2 agonist but Results section states mGlu4 agonist. 8) Most importantly, neither the co-localization of the two receptors in this system nor the absence of synergy in animals lacking one of the receptors has been explored. This manuscript presents very nice data in support of mGlu2-mGlu4 heterodimer receptors. The FRET experiments are convincing and demonstrate that the pharmacology of herodimers can be distinguished from that of either homodimers. Second, the authors show that several compounds have distinct actions on hererodimers compared to homodimers, such as different Hill coefficients or partial agonist or synergistic activities. Finally the experiments measuring cell swelling of cultured striatal neuron cell line as a proxy for adenylate cyclase activation are inovative and reveal the synergistic activity of BINA and VU0415374 in neurons. My only question about this manuscript is that the evidence of mGlu2-4 heterodimers in the lateral perforant path is most suggestive, but it is not conclusive. The synergistic effects shown could be caused downstream of the receptors in the Gi-coupled pathways. Given the pharmacological fingerprints presented in Figures 4 or 6, can similar experiments be done in hippocampal slices? Firstly, our data indicate that the formation of mGlu2-4 heterodimers is not the consequence of an over-expression of these subunits. Of note, the expression levels of both mGlu2 and mGlu4 are rather low in the striatal cell line, such that no direct responses could be measured using conventional second messenger assays. This is only when using a label free assay that mGluR responses could be measured. Also, our quantification of transfected mGlu2 receptors in hippocampal neurons revealed a 5-fold only increase in cell surface receptors compared to controls. We also report that the synergistic effect observed in hippocampal slices is lost in the mGlu4 KO mice, and that the increase in potency of the mGlu2 agonist LY354740 observed upon activation of the mGlu4 subunit cannot be reproduced by activating a co-expressed the Gi-coupled δ opioid receptor. We think our study brings strong pharmacological evidence for the existence of mGlu2-4 heterodimers in cells naturally expressing these receptors, and that this phenomenon is not the consequence of receptor over-expression. We agree that more work is needed to decipher the physiological significance of such heteromeric assemblies, but this is not the scope of our present manuscript that mainly concentrated on the development of assays aimed at characterizing mGlu heterodimers. Data with mGlu4 KO mice have been added, and confirmed that the LSP4-2022 effect is mediated through the mGlu4 subunit. As expected, no synergistic effect is observed between LY354740 and LSP4-2022 in the absence of mGlu4. 3) A number experimental details need to be clarified and rectified throughout the manuscript. It was felt that the Background and Materials and methods require more explanation, since the methods represent a new way of demonstrating heteromer interactions. We feel that the majority of these issues can be addressable in a timely fashion and recommend a major revision for this paper. The major concerns are listed below. The Materials and methods section has been completed with as much information as possible to allow any reader to repeat the experiments. There are many questions raised in this first point of the referee that we will clarify, one by one. The referee is right that either assay (heterodimer specific biosensor, or specific targeting of the heterodimer at the cell surface) are conducted in the presence of intracellular receptors. However, when using the biosensor, because we used non cell permeant CLIP and SNAP substrates, only cell surface receptors carrying an extracellular CLIP or SNAP tags can be labeled. Only those cell surface receptors will then be recorded in any biosensor assays. Regarding the ER retention of the C1 and C2 constructs, although retained intracellularly, and even though some authors argue that intracellular mGluRs can signal, we have never been able to measure any signaling with the C1 or C2 constructs expressed alone upon glutamate application (Huang et al., 2011, Brock et al., 2007). We modified the text to make this point clearer to the readers. The referee also questions the possibility that the reported data results from an over-expression of the receptors. We don't think this is the case, for the following reasons. i) The interaction between cell surface receptors may be artificially favored due to an over-expression of the proteins. This is well illustrated by the work by Calebiro et al., 2013 reporting that the proportion of dimers and oligomers increases with receptor density at the cell surface. Under our experimental condition, although we can measure TR-FRET between subunits, we have not been able to measure significant signal under conditions where TR-FRET can only result from the proximity between dimers (Maurel et al., 2008; Doumazane et al., 2011). Moreover, various experimental protocols were used to estimate the size of the mGlu2-4 complexes and all were consistent with strict heterodimers (Doumazane et al., 2011). that a receptor with the pharmacological properties of the mGlu2-4 heterodimer can be functionally detected whereas these cells express a low amount of each receptor as evidence by the difficulty in measuring a second messenger response upon agonist activation. Of note, these functional data were obtained in control nontransfected cells naturally expressing mGlu2 and mGlu4. iii) The mGlu2 receptor expression in transfected neurons has been quantified, and is reported in another study to be submitted soon. Because a few percent of the cultured neurons are transfected under our experimental conditions, radioactive ligands could not be used to quantify mGlu2 receptor expression. We then took advantage of an mGlu2 specific nanobody (publication submitted) labeled with a fluorophore to compare the fluorescent signal in non-transfected neurons and in transfected neurons. Data are shown in the Author response image 1, and show that the mean expression of mGlu2 receptors is 5 times higher than the basal expression in non-transfected neurons. In the study, we also provide evidence that mGlu2 homodimers, despite the 5 times higher expression, do not form larger complexes under control conditions, remaining strict dimers, again illustrating that the mGlu2-4 association observed in the present study unlikely results from a too high expression of the subunits. Overlap between expression levels of mGlu2 in native and transfected neurons. Expression of mGlu2 receptor in native and transfected primary hippocampal neurons was measured by immunofluorescence using a d2-labeled single domain antibody (DN1-d2) specific for the mGlu2 receptor. (A) Schematic drawing of DN1-d2 labeling of the mGlu2 receptor. (B) Example of DN1-d2 labeled native neuron with endogenous expression of mGlu2 receptor. (C) Mean intensity of DN1-d2 labeling of neurons with endogenous mGlu2 receptor expression (28 cells) or transfected with mGlu2 receptor (26 cells). The endogenous mGlu2 expression overlaps with the expression in transfected neurons in the 55-170 subunits/Veff range (shaded area). A specific paragraph in the Discussion has been added to discuss this issue. The last aspect raised in this first point of the referee relates to the subcellular localization of the receptors. As illustrated in Figure 5, the transfected subunits are found in most neuronal compartments, whereas both mGlu2 and mGlu4 receptors are expected to be mainly targeted to the terminals. However, when using our specific mGlu2 nanobody (European Patent Application EP3164415, Scholler et al., under revision), mGlu2 receptors could be identified in a few hippocampal neurons, with a wide distribution of the labeling on the entire neuron (see Author response image 2), as observed with the transfected receptors (Figure 5). However, the primary goal of this part of our work was to examine whether mGlu2-4 heterodimers can be detected in cells that endogenously express these subunits. We think our data illustrate that this is indeed the case, with the above-mentioned limitation. Data shown in Figure 6 are from control cells, not from transfected cells, so there is no specific issue here regarding miss localization due to transfection. Forskolin induces the shrinking of several cell lines. Indeed, forskolin is one of the classical components of differentiation cocktails (Experimental & Molecular Medicine (2004) 36, 52–56; BMC Cell Biol. 2010 Apr 16;11:25). STHdh, can be differentiated using a cocktail containing forskolin. During our initial studies with these cells, and looking for mGlu2 or mGlu4 inhibition of forskolin-induced cAMP production, we came up to this interesting observation that can be easily followed using the Xcelligence label-free system. We then used this characteristic to evaluate Gi protein activation by mGlu2 and mGlu4 agonists. STHdh cells are well characterized and largely used as a neuronal model. These cells express different key proteins expressed in striatal neurons (DARPP-32, PSD95, D1, EAAT…). As a search for a neuronal cell line to test the possible formation of mGlu24 heterodimers, we chose these cells as an alternative to cultured neurons as such cells are easier to transfect. Of note, mGlu4 is known to be expressed in some striatal neurons (those projecting to the globus pallidus) (Beurrier et al., 2009). Although mGlu2 receptors are found in the striatum (Wright et al., 2013), these mostly correspond to pre-synaptic receptors in cortico-striatal terminals (Ohishi et al., 1993; Conn et al., 2005) since low in situ hybridization signal could be detected in striatal cells (Ohishi et al., 1993; Gu et al., 2008). We then checked whether mGlu2 and or mGlu4 mediated responses could be detected in these cells, and it was the case using the sensitive label free assay. These cells were primarily chosen as a neuronal cell model, rather than a model for striatal neurons with the possibility to propose hypothesis regarding the role of mGlu2-4 heterodimer in the basal ganglia network, and their possible use to treat Huntington or Parkinson diseases. We think a more integrated work with more native situation will be necessary before entering into such discussion. In Figure 1—figure supplement 3A and 3B, SNAP-mGlu4 and CLIP-mGlu2 levels at the cell surface are determined. No significant amount of CLIP-mGlu2 C2KKXX was observed at the cell surface in agreement with our previous studies (Doumazane et al., 2011; Huang et al., 2011), and as such these data were not included. We now refer to our previous work in the main text. However, expression of 0.4% SNAP-mGlu4C1KKXX was detected in comparison with SNAP-mGlu4 WT, as indicated in Figure 1—figure supplement 3. This was considered a “minimum leaking”. The orthosteric site is the site were the natural ligand binds, in contrast to the allosteric site, defined as a site different from the orthosteric site (Christopoulos et al., Pharmacol Rev 2014). To clarify the issue, we replaced “orthosteric” by “glutamate” so that non-specialist readers will understand that we mutated the binding site where the natural ligand binds. Although we agree that crosslinking experiments can be informative, such experiments are also highly criticized because transient association can be sufficient for crosslinking. Accordingly crosslinked species will accumulate during the duration of the crosslinking experiment. A nice example is reported in our recent paper (Xue et al., Nat Chem Biol 2015) where crosslinking could be observed between mGlu2 dimers providing these are in the active form. Such crosslinking resulted in the appearance of FRET between dimers. However, no such FRET could be detected without crosslinking, indicating that only a very small proportion of the dimers were associated into larger complexes under control condition, and that such complexes accumulated upon crosslinking. To us, the best illustration that mGlu2 and mGlu4 associate into heterodimers, rather than the association between two homodimers, is the large change in FRET upon receptor activation, illustrating that the FRET really originates from a specific association of the subunits as observed with the homodimers. In addition, in our previous study (Doumazane et al., 2011) we used several approaches to demonstrate that mGlu2 and mGlu4 form heterodimers at the cell surface rather than larger complexes. We now refer to this previous study in our revised manuscript. The title has been modified as follow: "Pharmacological evidence for native metabotropic glutamate receptor heterodimers in neuronal cells"
We still think the data obtained with the neuronal cell line, support the existence of native heterodimeric mGlu2-4 in non-transfected cells. Although our data in hippocampal slices are not fully conclusive, as discussed with referee #3, still they are consistent with our proposal. Indeed, such a strong synergy between Gi-coupled receptor agonists has never been observed through signaling synergism. Because our study was primarily aimed at establishing innovative approaches to specifically study the properties of mGlu heterodimers, and because the identified properties can be observed in cells naturally expressing both mGlu2 and mGlu4, we think our new proposed title is appropriate. We still think the information given in the Abstract is necessary for a wide readership. Unfortunately, the Abstract could not be extended due to length constraint. We are really sorry for not checking carefully the Materials and methods section before submission of our manuscript. We thank the referee for pointing all these missing parts. The Materials and methods section has now been complemented and includes all details the reviewer requested. Controls using ER-retaining constructs can be found in Figure 1—figure supplement 3 as detailed previously. 1) Subsection “A FRET-based sensor to identify mGlu2-4 specific fingerprints”: As written it appears that the concentrations of SNAP-donor and CLIP-acceptor substrates that gave a signal for the heteromer did not give a TR-FRET signal with respective receptor homomers – is this true? This needs to be clarified in the manuscript. When using as substrates SNAP-donor and CLIP-acceptor, then the homodimers composed of two SNAP-tagged subunits only carries a donor, such that no FRET signal is generated. Similarly, the CLIP-tagged homodimer is labeled with the acceptor only, and will also not generate a FRET signal. Then, as indicated in the text, only the heterodimer composed of one subunit tagged with a SNAP, and another subunit tagged with a CLIP, will be labeled with both a donor and an acceptor, such that TR-FRET signals will be generated by the heterodimer only. This doesn’t mean (as suggested by the referee’s comment) that homomers cannot be formed, but simply that our experimental conditions allow to monitor by FRET signals coming from the heteromers, exclusively. This point has been made clearer in our revised manuscript. The requested Table has been added (Table 1). The requested information has been added in the figure and figure legend. It is difficult to perform a dose response curve in a slice preparation. Instead of doing these experiments, we preferred to generate data from slices prepared from mGlu4 KO mice (see revised Figure 7). The colors are related to the FRET intensity (color scale, the higher FRET is red, while the lower is dark blue). We want to make clear that the three graphs were generated from the same set of cells transfected with various amount of CT-mGlu2 and SNAP-mGlu4. The TOP graph reveals FRET data after CLIP labeling with both donor and acceptor substrates. It shows the best conditions leading to high amount of mGlu2 homodimers. The middle graph reports data after labeling the cells with donor and acceptor SNAP substrates. It shows the best conditions to get higher amount of mGlu4 homodimers. The bottom graph shows data after labeling the cells with a SNAP donor substrate, and a CLIP acceptor substrate. Then this bottom graph shows the best condition to get higher proportion of mGlu2-4 heterodimers. By comparing the three graphs, one can identify the conditions that favor the heteromer expression relative to each of the homodimers. The figure legend has been modified. We thank the referee for pointing these mistakes. These have been corrected. Experiments have been performed in slices prepared from mGlu4 KO mice. The data are now included in the revised Figure 7. Data show that the effect of LSP4-2022 is lost in these slices indicating that mGlu4 was involved. In contrast, the effect of the LY354740 remains unaffected. 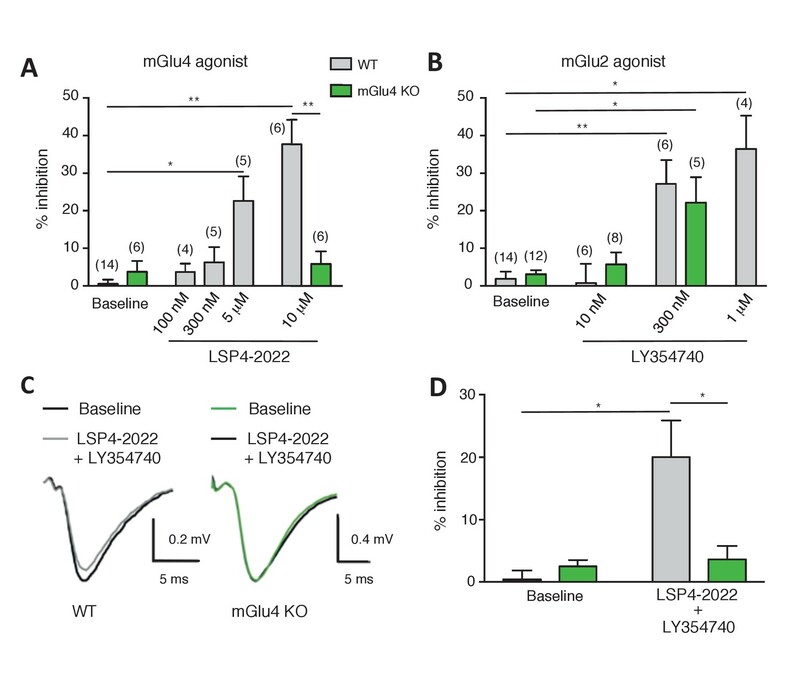 We also found that LSP4-2022 no longer potentiate the effect of LY354740 in the absence of mGlu4. Regarding the co-localization studies, it is known that both mGlu2 and mGlu4 are expressed in these terminals, and our data confirm this since both LY354740 and LSP4-2022 inhibit transmission. Performing co-localization studies would need more time for us to conduct such studies especially because these would need electron microscopy to really be meaningful. We thought that such studies are out of the scope of the present study, concentrating in original approaches to specifically study the pharmacological properties of mGlu heterodimers. We also preferred to concentrate on the time available to produce a revised manuscript, on the characterization of mGlu4 KO slices. The referee is right, one cannot exclude the possibility of a synergistic effect between two Gi coupled receptors, although such a synergy has not been reported so far. We therefore modified our manuscript to minimize our conclusion of the existence of mGlu2-4 heterodimers in the perforant path terminals, and rather claim that our data are consistent with the presence of such heterodimers. In order to offer a stronger conclusion, we aimed at studying, in recombinant systems, the possible synergistic effects between mGlu2 and mGlu4 homodimers. Although no such synergy could be detected with the TR-FRET biosensors (the mGlu2 pharmacological properties shown in Figure 1 were measured in the presence of mGlu4 and mGlu2-4), such observation did not exclude a synergistic action downstream of receptor activation. We then aimed at expressing mGlu2 and mGlu4 homodimers in cells without the presence of mGlu2-4 heterodimers. This was theoretically possible using mGlu2C1, mGlu2-C2 and mGlu4. We were expecting that co-transfecting these three constructs would lead to mGlu2 and mGlu4 homodimers at the cell surface only, since neither mGlu2-C1-mGlu4 nor mGlu2-C2-mGlu4 heterodimers were expected to reach the cell surface due to the presence of the ER retention signal in the C1 and C2 tails. Unfortunately, these two combinations were found in sufficient quantities at the cell surface, preventing any analysis of a possible synergistic effect between mGlu2 and mGlu4 homodimers. We then co-expressed mGlu2 and the Gi-coupled δ opioid receptor (DOR), and examined whether activation of DOR could potentiate the effect of the mGlu2 agonist in inhibiting Forskoline-induced cAMP formation using the pGlo-sensor. As show in Figure 6—figure supplement 2, no potentiation was found, despite the equivalent expression of both receptors, and the correct coupling of both receptors to the inhibition of cAMP formation. Although not fully conclusive, we think these additional data strengthen our view. Regarding the last comments of the referee, though we agree that such experiments would be great, it is quite difficult, time consuming, and expensive in terms of the amount of drug needed to perform a full dose-response curve using electrophysiological recordings in brain slices. We then preferred to concentrate our work in getting data with the mGlu4 KO mice. © 2017, Moreno Delgado et al.